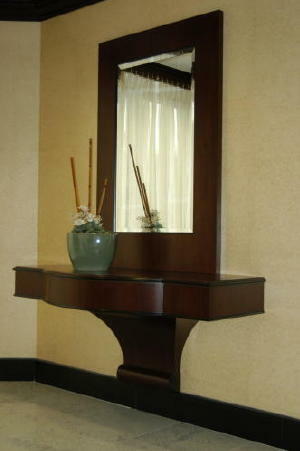 Wood River Veneer does fabricate a variety of fixtures for both residential and commercial construction. We frequently fabricate box beams in a variety of wood species. To date the longest box beam facade that we have constructed is 29 feet. It is not unusual for us to construct wall mounted desks and media centers, columns, pilasters, art niches along with a variety of mouldings. All of which may or may not accompany sequenced wall and or ceiling panels. We also fabricate and assemble wood signs for hotels and other commercial applications. So if any of this applies to what you are looking for give us a call and we will try to help you.